Firstly, as you can see we've started recording the changes to the website here. With our first blog provider shutting down and our second being bought by Yahoo we thought it was time to bring this in house. With that out of the way, here's a rundown on what's changed in this build. One of the biggest changes this time is not something new, but something that's been removed. Ever since we first released the website we tried to differentiate between two terms; games and matches. For example your “game” might be every thursday at 6pm, which meant your next 2 “matches” would be Thu, 25th Apr and Thu, 2nd May. We thought it was an important difference that mattered, but the last few years has taught us people find it all a bit confusing (and understandably so). From today “game” and “match” mean much the same thing. You'll now find a new icon on match menu for editing your match template. Your match template lets you change all the settings for your matches. Who else has their name down for a match – useful if you need to arrange a lift? Who else is in your squad. You can also see pitch information for running matches ... more on that later! We've always kept a history of matches that have been played (about 3 months worth). 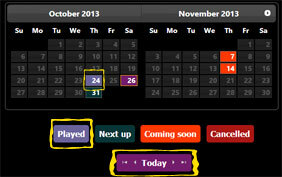 As you can see the diary has been enhanced to show past matches. Diary feature is not available on mobile devices, sorry. As a result they'll be lots more matches listed in the diary view so we've added a small widget to move around each match. We've had avatars in toepoke for ages! So why are we going on about them now? If you don't have an avatar setup, we'll generate a unique Monster for you, rather than the default toepoke avatar. 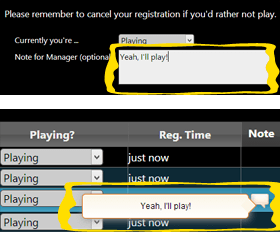 The registration list (showing everyone who's playing on a particular day) now shows any notes the player has entered when putting their name down (see right). Managers can add notes against members of the squad, perhaps to remind you someone owes some money from a previous match. Finally we've added the ability to add notes against the reminders that are e-mailed to your players. Useful if you have a work thing on one week and want to remind your squad. We built toepoke to give you the best chance of having your match go ahead, with everyone turning up and have a great time. One of the ways we do this is by telling you what's happening through the week. We've had feedback that it e-mails you a bit too much, so we've added an e-mail preferences setting you can tweak. There are 3 settings; All, some and none. All – You'll receive all the e-mails you already get; this is still the default setting. Some – We've pulled this back to the minimum we think you need. For example we won't tell you when you've put your name down. None – No e-mails about matches will be sent. Useful if you're going on holidays for a few weeks or you have an injury to recover from. You'll still get password reminder and account related e-mails. Mobile phone contact numbers are listed where appropriate. A couple of design tweaks. Changed the saving splashscreen – yup that big purple thing you keep seeing! The membership screen now shows who nominated a squad member (useful if you can't remember how someone joined). Previously players couldn't see matches coming up. Now they can and they can say in advance that they won't be playing – useful if you're going on holidays. How notifications are shown on screen has changed, plus we've added a little prompt to remind people to make sure they aren't on holiday when a match is on. It was possible for a user to associate a social logon with two accounts. Issue with the squad directory wasn't showing all public squads.